The MCCC Board of Trustees raised the tuition rate for in-county students by 2.5% on April 1. Students who live in Monroe County will see an increase of $2.75 per billable contact hour - to $112.25 - in Fall 2019. This translates to a price hike of roughly $35 to $40 for full-time students. Out-of-county students will see an increase of $5 per hour to $199.50. Out-of-state students will have a hike to $222 per hour, a raise of $5.50. 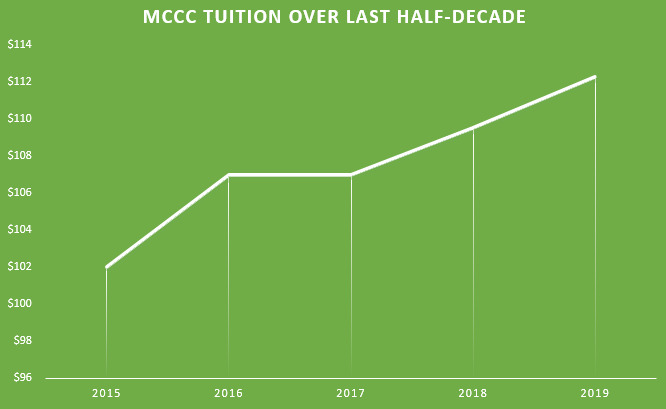 Even with this increase to the tuition rate, MCCC is one the cheaper community colleges in the state, speaking in terms of billable contact hours, according to Sue Wetzel, the vice president of administration. Graph shows the increase in tuition over the past five years, from $102 to $112.